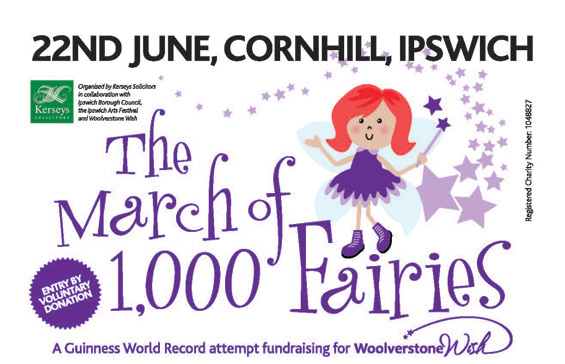 Kerseys is proud to support The March of 1,000 Fairies — a Guinness World Record attempt to gather the largest number of fairies in one place — in Ipswich. This is a fund-raising event in support of the Woolverstone Wish charity. It all takes place on 22 June 2014 on the Cornhill in Ipswich town centre. The march begins on the lawn in front of Christchurch Mansion in Christchurch Park, led by the samba band Samboomba, all the way down to the counting area on the Cornhill. There will be fun activities and competitons. Click the image below to open the PDF and find out all the details. The March of the 1000 Fairies is organized by Kerseys Solicitors in collaboration with Ipswich Borough Council, the Ipswich Arts Festival and Woolverstone Wish.